Jessica Callihan is a wounded warrior with a lot of metal pins, screws and parts. She bonded with fly fishing, expresses it through her art, and contributes by carrying the fly fishing message to other vets. When I spoke with her it was Veterans Day weekend. She had just gotten back from a week in Washington, DC, testifying before Congress, along with others, about veterans’ matters. She was encouraged by responses, but not by fellow vet Ryan Zinke, Secretary of the Interior, whom she said only seems dedicated to matters critical to extractors of oil and gas interests. 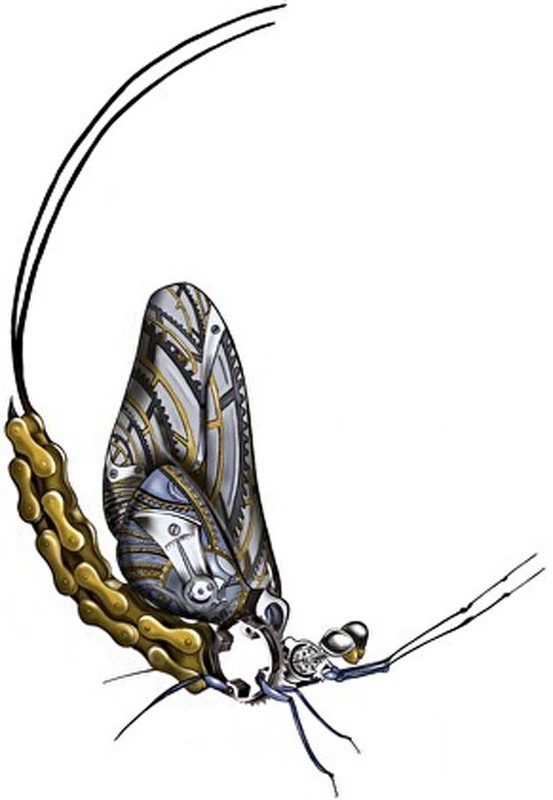 Why I asked, would you embrace fly fishing with such a passion? She said fly fishing led to a better life experience, a temporary escape from pain, and the out of doors experience she was born to. If she were driving on an unfamiliar road and came to forks that require a single, life-changing choice, which one would she choose? One fork well traveled with a smooth, weedless surface? The second fork showing some tire tracks but weeds growing on the centerline? The third with no tire tracks, no sign of travel and a steep mountainous incline? Yup. You’re right, that one. You can tell her how to do anything, she’ll listen and embrace learning, but don’t tell her this is what everybody does and it’s the only way. Yup. That’s her. 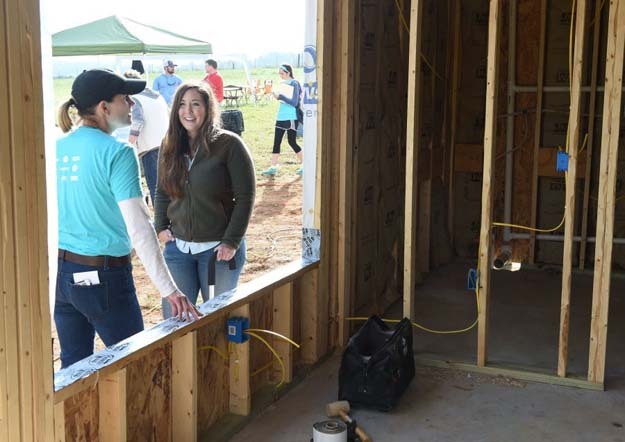 Annette Brun of Scripps Networks Interactive, left, talks with Jessica Callihan as volunteers begin to build an art studio and ramp for Callihan at her home in Greenback (Tennessee) on Friday, Sept. 30, 2016. A Navy veteran who was injured during her service, Callihan had 10 surgeries and is now living with chronic regional pain syndrome. Photo by Amy Smotherman Burgess of News Sentinel, Knoxville, Tennessee. A Michigan farm girl with a full academic scholarship to Western Michigan skipped her last two years to serve her country post 9/11. In 2008, E3 Callihan, Aviation Electrician, stationed in Jacksonville, Florida, suffered a career-ending injury that shattered her right leg, earned 11 surgeries, five years in and out of a wheelchair, and unimaginable pain. The gamble, if it worked, would save her leg. She opted for an implanted, self-triggering neurostimulator that sends electrical signals to treat pain. Unorthodox rehab, she decided, would at least get her outside. Farm girls are not fond of couches, TV, neon signs, glass and steel canyons that block out the sun, or of miles and miles of asphalt. Out of doors all started again for her with an engagement at Mossy Creek, Virginia. It was at a Project Healing Waters camp. Very coordinated and an eager learner sent her where she’s always comfortable, to the head of the class, but that had nothing to do with healing. 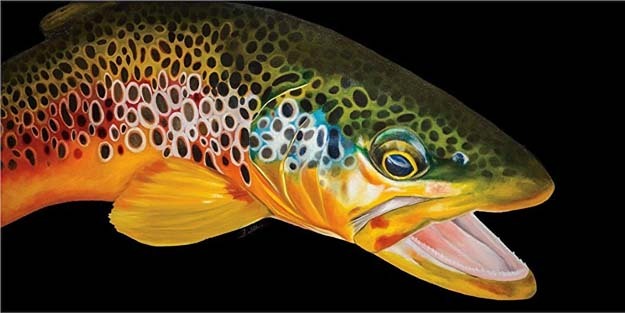 Along with painting, the act of fly fishing has become another neurostimulator. But like the stimulator itself, the parole from pain does not last a long time; it always has a window that closes. After a time, she decided to take advantage of one of the best programs the government has ever come up with, paying for veterans’ college. In 2012 Jessica enrolled at Maryville College. A small, privately funded institution of higher learning with exceptionally high academic recognition and a world-class arts program. The art of being Jessica. Look metallic? Think of her metal parts. Jessica has had many mentors on her art journey. One of special importance to her is Thom Glace. Thom is one of the top watercolorists in the world. 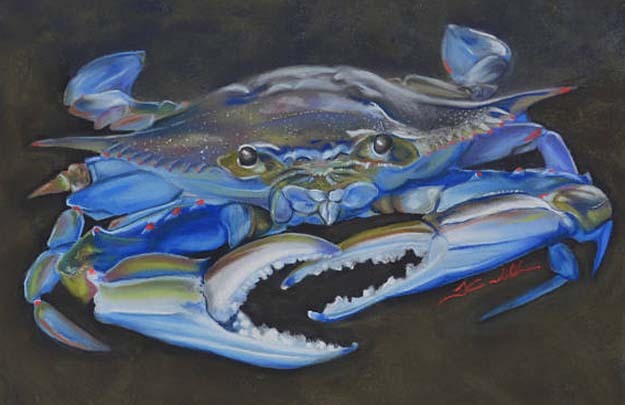 Jessica and Thom share a fascination with trouts, bugs, and the natural world, but work, mostly, in different mediums. Click to visit Jessica’s studio . . .